Have you recovered from your Halloween hangover yet? Whether it was candy-indused or just too much partying, we're now starting one of the best times of the year for movies. Lots of great stuff this week incluing an awesome, and FREE!, outdoor event on Saturday which is my pick of the week! Alamo Drafthouse: An always fun and exciting experience, AGFA is having their monthly secret screening at 8:00pm. Or you can check out an old Nolan film, THE FOLLOWING, at 8:30pm. Alamo Drafthouse: The awesome screening of TOMBSTONE paired Lakewood beer is unfortunately sold out, but there are still tickets available to see INTERSTELLAR in 35mm at 8pm. The Texas Theatre: If your Tuesday needs to get trashy, then Tuesday Night Trash has a presentation for you: THE HUMANOID at 9:15pm. Granada Theater: The weather is gorgeous, so come out to a rooftop movie with whiskey specials and great food. FEAR AND LOATHING IN LAS VEGAS will be showing at 8:30pm. Alamo Drafthouse: There are some great films coming out this week, and if you don't want to fight the lines for INTERSTELLAR, then you should check out BIRDMAN at 8:15 or 11:15. It has been getting tons of praise and is definitely worth your time. Angelika Dallas: There is a Stars and Stripes Festival going on through the 9th. All information is here, and there are plenty of great films to check out. The Texas Theatre: If 35mm movies are your speed, then definitely check out INTERSTELLAR at 3pm. Perfect afternoon activity. Alamo Drafthouse: Another chapter in the James Bond anthology tonight, and at 7pm you can check out the gloriously bad MOONRAKER. 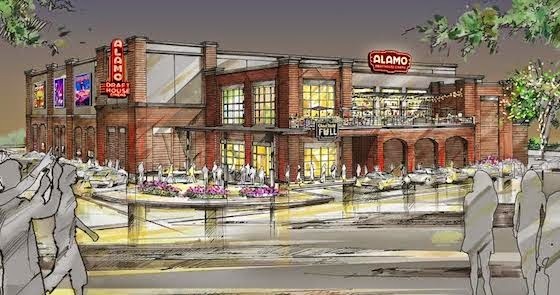 Alamo Drafthouse: In my pick of the week, the Alamo will be presenting an outdoor film, FERRIS BUELLER'S DAY OFF, at the newest property which will open next year! The event is free and is full of beer, food, and outdoor fun. Bring a lawn chair and enjoy the film! Alamo Drafthouse: If you've been missing some good 1980's science fiction in your life, then come check out FLASH GORDON at 11:45am. The Texas Theatre: If 35mm movies are your speed, then definitely check out INTERSTELLAR at 2pm. Perfect afternoon activity.